The newest Inspire is already here! DJI Inspire 2 quadcopter is significantly better than its predecessor Inspire 1. The second version of Inspire enables capturing 5.2K videos in Cinema DNG RAW, Apple ProRes an other formats. 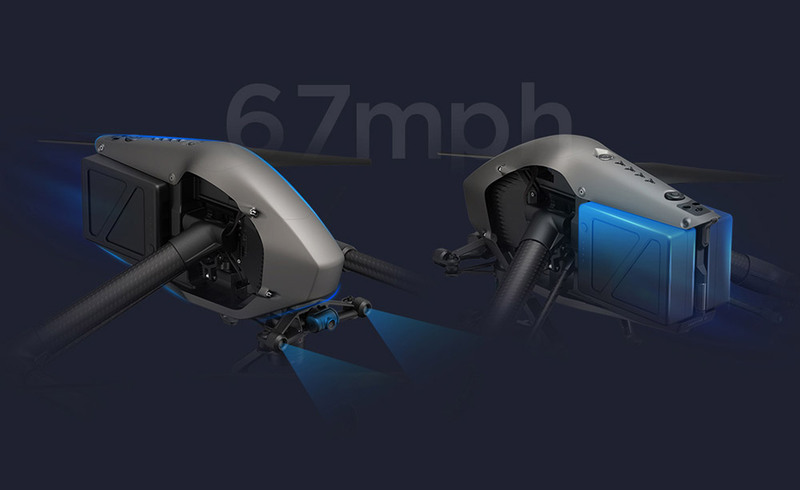 The camera drone accelerates from 0 to 80 kph in 4 seconds and the max speed that can reach is 94 kph. The Inspire 2 can descent with max speed of 9 mps, which is an incredible achievement for DJI Inspire 2 developers. 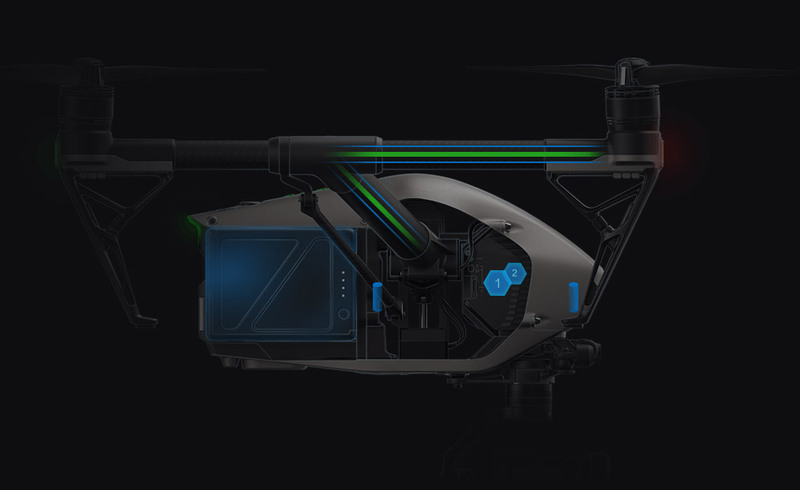 The system of two intelligent flight batteries allows the drone to stay in the air for 27 min. (with camera X4S), and the heating battery system enables it to fly at very low temperatures. 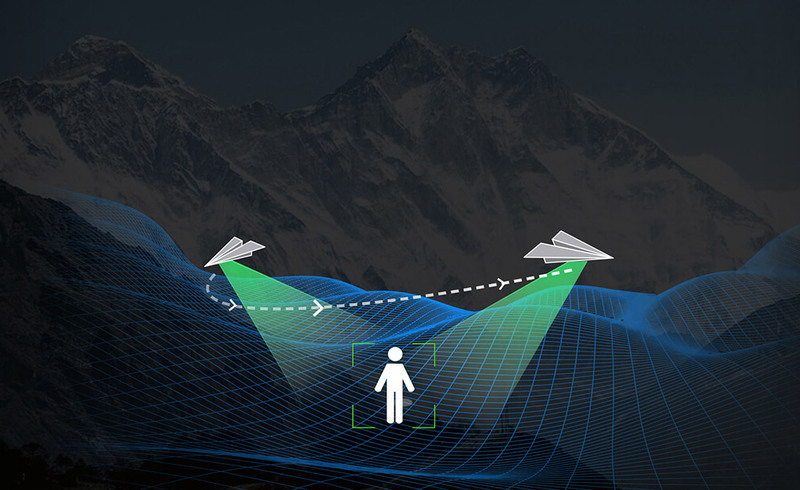 FlightAutonomy system was developed for DJI Inspire 2 providing two directions for obstacle avoidance. 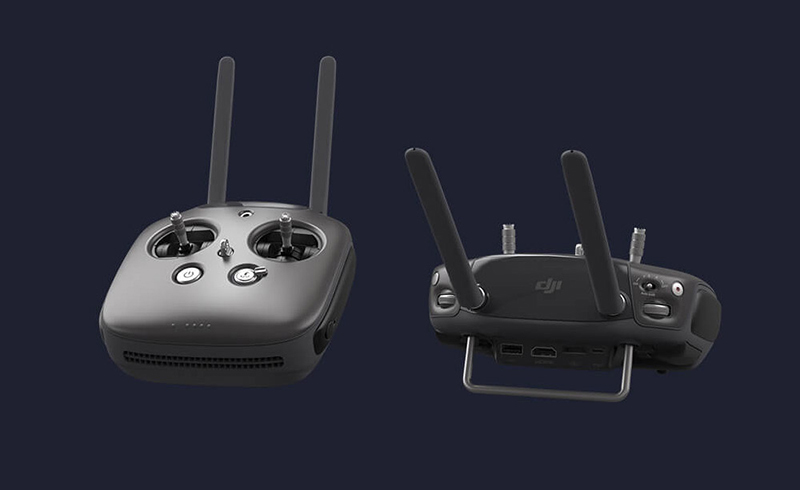 The DJI Inspire 2 design is achieved by an аluminium alloys with magnesium. The quadcopter has Vision Sensing System and 2-axis FPV camera. On the drone can be mounted different models of 3-axis gimbals with built-in camera. 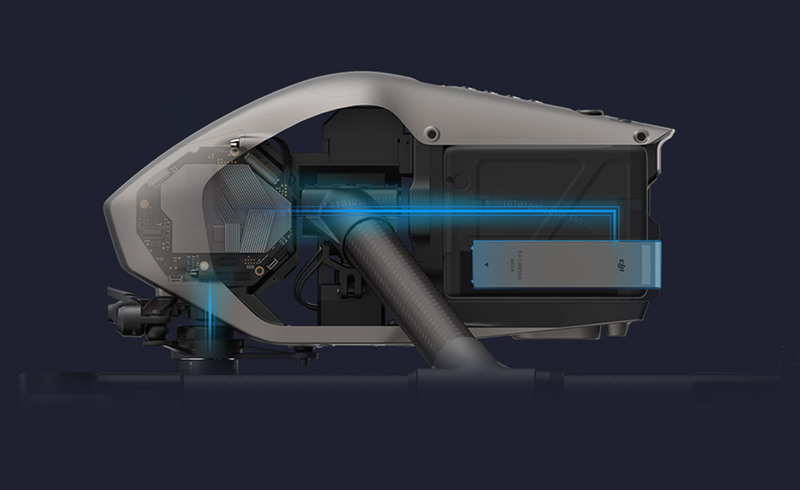 For more safety flight Inspire 2 developers have provided a second battery, which will start to operate in the event that the level of the first battery reach critically low levels or fails, to allow the DJI Inspire 2 camera drone to land safety. Battery heating system allows the quadcopter to fly at very low temperatures. 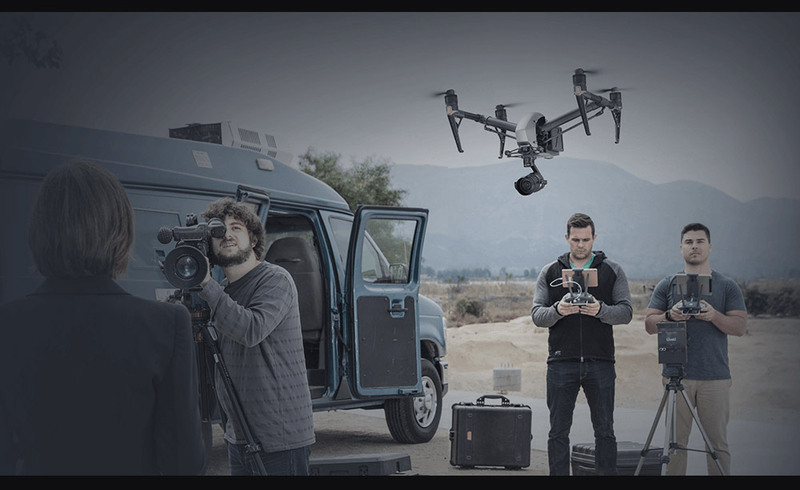 The DJI Inspire 2 camera drone allows you to take videos with 5.2K resolution @ 4.2Gbps and 4K resolution @ 100Mbps. Supported video formats are CinemaDNG, Apple ProRes, etc., and supported video codecs are H.265 and H.264. Created videos can be stored simultaneously on a DJI CINESSD and a microSD card. The DJI Inspire 2 remote controller has a built-in Lightbridge 2 technology. It can operate at 2.4 GHz or 5.8 GHz frequency. The master-slave mode means that there may be a master remote controller which can be used to control the drone and several secondary remote controllers for camera control. The DJI Inspire 2 remote controller has a HDMI and a USB port, and its range reaches up to 3.5 km. 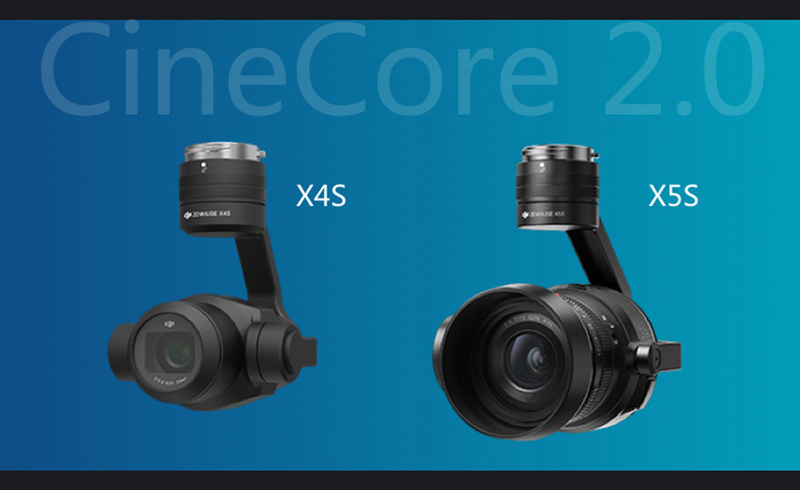 The newest CineCore 2.0 system allow you to take amazing 5.2K* videos in CinemaDNG* or Apple ProRes* format. 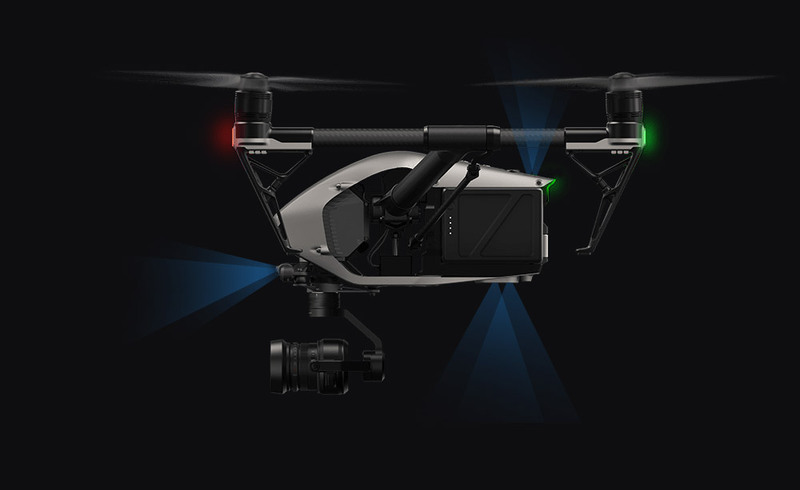 CineCore 2.0 is integrated in the nose of DJI Inspire 2 and can operate with any camera connected through dedicated gimbal port. DJI Inspire 2 camera drone has a few obstacles sensing sensors which scanning 30 meters ahead it, allowing Inspire 2 to fly safety with a speed of 54 kph. Infrared sensors located at the top of the drone scan for obstacles five meters above the quadcopter – that allow it to fly safety indoors. The system is active during normal flight, RTH and all intelligent flight modes. The sensors are the core of the FlightAutonomy system – this protection system taking care of the safety of quadcopter during flight. In this flying mode the pilot can capture complex, unique footage. 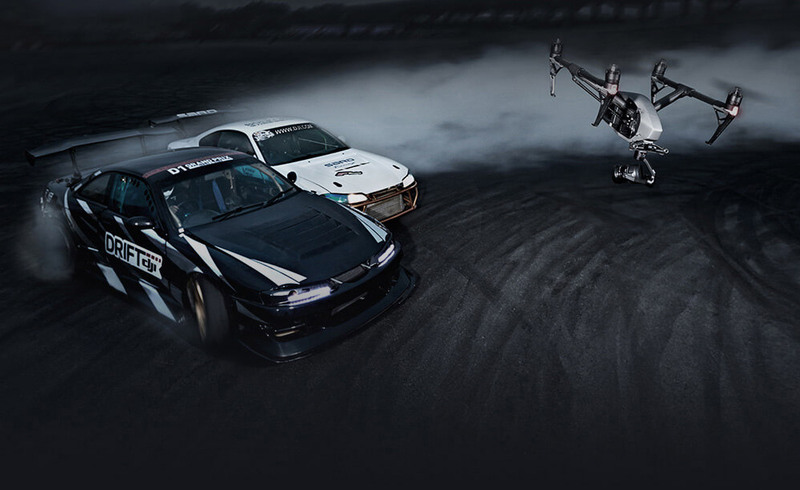 The Spotlight Pro mode uses a series of algorithms, thanks it the Inspire 2 camera drone began to follow the specified object, no matter which direction it fly. In Quick Mode you can select the tracing object, and in Composition Mode you can choose the subject and its position. When the subject is positioned at the specified location you should just touch the screen and tracking will starts. The camera can be rotated in the desired direction to create amazing images. Spotlight Pro is active in all flight modes, including ActiveTrack, TapFly, Waypoint and Point of Interest. The 2-axis onboard FPV camera is designed to monitor the flight and it is used when the TapFly mode is activated. Just with one tap on the mobile device screen you can set the flight direction of the drone. This way the operator can focus on gimbal movement. 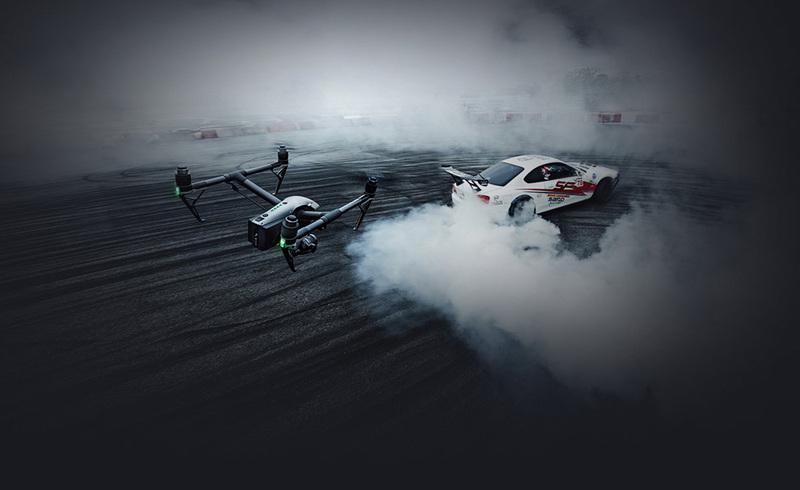 ActiveTrack mode allows DJI Inspire 2 camera drone to recognize and track a number of objects, including people, bikes, cars or boats. The profiles can be adjusted depending on the selected tracking object, which means that you get more precision when using this mode. The forward and backward vision positioning systems allow DJI Inspire 2 to create a map of the route during the flight. 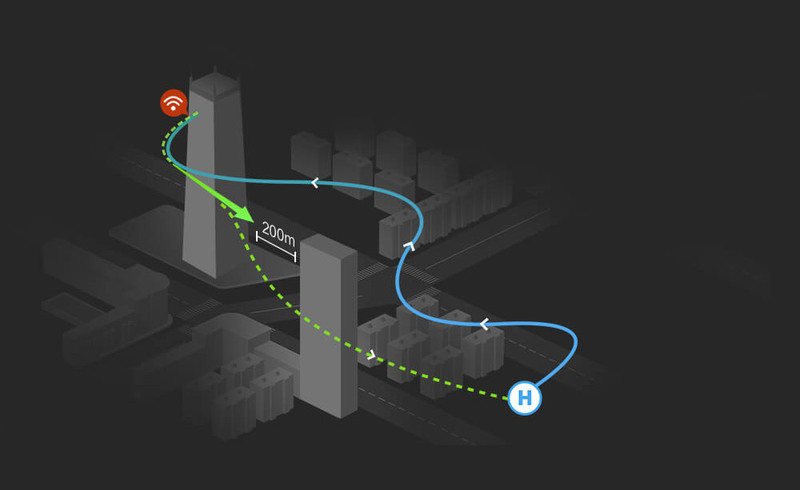 If the signal is lost, and the Smart Return to Home mode is enabled, the drone will return to the home point along its original route. When the signal regains Inspire 2 will continue to return in a straight line to the home point. On its way back the Inspire 2 uses the main camera to detect potential obstacles 200m in front of it, which allows the quadcopter to plan a safe route. The new wireless HD images transmission technology sends the video signal from the main remote control to slave, as they may be located at a distance of 100 meters from each other without losing signal quality. The new propulsion system allows the DJI Inspire 2 camera drone to fly at a maximum speed 94 kph, to descend with 9 mps and climbs with 6 mps. The inspire 2 can accelerates from 0 to 80 kph in just 4 seconds and a maximum flight angle 40˚. Precisely adjusted two remote controllers helps you to manage the drone more accurate and easy. Thanks to the new propulsion system the Inspire 2 can fly at 2500-5000 m above sea level (with additional improved propellers). The intelligent flight batteries with built-in heating system allow quadcopter to fly at extremely low temperatures (-20˚C) - which, until now, was impossible. The reliability of DJI Inspire 2 quadcopter has been improved twice thanks to built-in IMU and barometer. The intelligent flight control system monitors redundancy system and provides reliable information about the flight. The new obstacle sensing system reduces the risk of collision for DJI Inspire 2 quadcopter. Thanks that system the drone will be able to avoid obstacles on its route. The system of two intelligent flight batteries allows DJI Inspire 2 to land safe even a problem with one of batteries occurs. In this situation the second battery will be activated and will provide enough power for the safe landing of the drone.